COMPREHENSIVE CONTENT - we cover core material and integrate across topics to make it clinically relevant. EVIDENCE-BASED - we provide references to our content and integrate it into our practice questions. MONEY BACK GUARANTEE - we stand behind our premium packages and guarantee you will pass*. Comprehensive question bank to give you confidence as you practice applying knowledge. Complete packages that include everything you need to pass your specific board exams or study topic of interest. Be confident for the real exam by taking our practice exams. Live courses and online classrooms by highly trained faculty and educators. Customized lectures, test questions, exams and detailed reports for universities, hospitals and training programs. Thanks for a great review on the BCACP which I passed in May. I work in a large safety net family medicine clinic and your lectures were very thorough and clinically useful for not only the exam, but in practice as well. Your biostatistics review was especially helpful in relation to applying the methods to cases. I will be referring my residents to your review courses in the future, well done! - J.G. 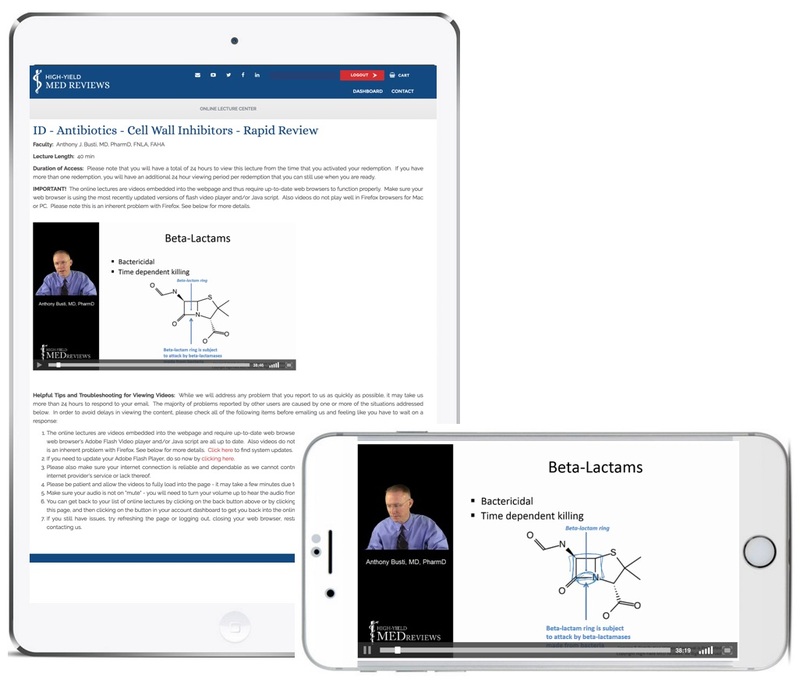 Professionally recorded lectures - just like being in a class. 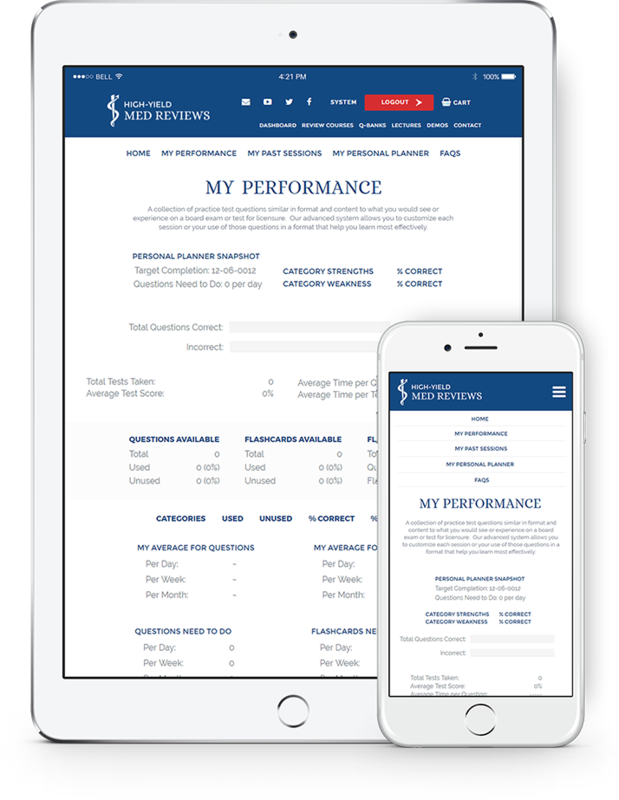 High-Yield Med Reviews is fully functional on all smartphones. While on our homepage, just add a push icon to your home screen and you are ready to go. 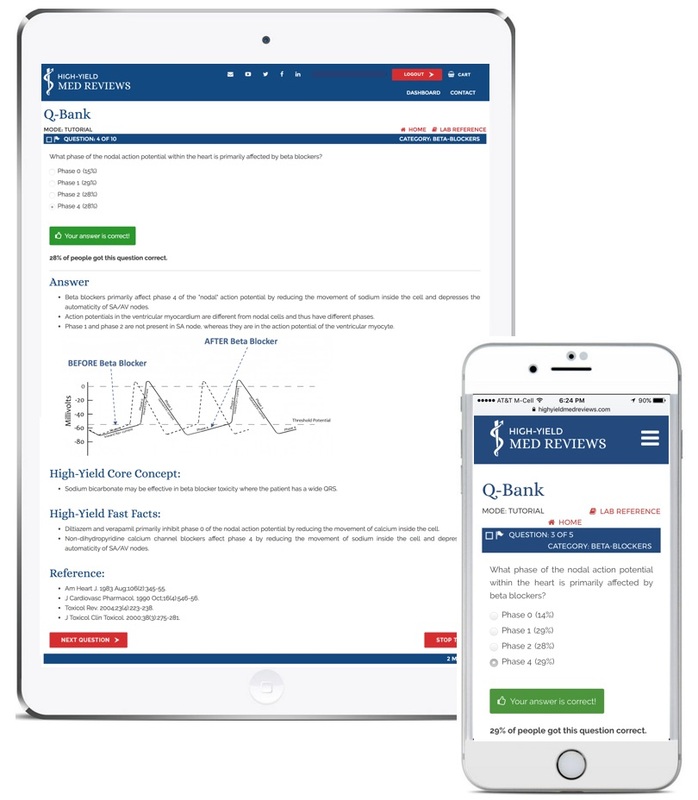 After answering our practice test questions in our Q-Bank, you will be able to receive feedback not only on what the right answer was and supporting rationale, but you can visually compare your performance by seeing what others chose as answer choices. 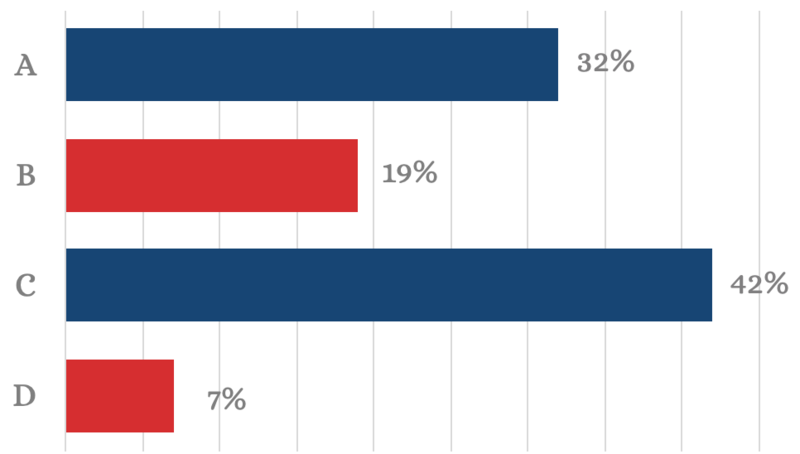 Identify your overall performance, average time taken per question, and areas strengths and weakness for your exams so that you can focus your preparation and learning to maximize your chances of success. Our system tracks your progress to determine how many practice test questions you have completed and how many you need to do on a daily, weekly, and monthly basis to get done before your exam. We are so confident in our Premium Review Course Packages at a subscription of 3 months or more that if you do your part we guarantee you will pass your exam the first time or we will give you 100% of your money back.